I absolutely love this week’s #PlayfulPreschool theme! Rainbows! So many great ideas that I can’t wait to use them all! Be sure to check them out at the bottom of this post. My preschooler had a blast with our fine-motor rainbow art. She was begging for more after all the supplies had run dry, so I know this is an activity she will definitely want to repeat. In fact, we had so much fun, that I will be posting about an extension activity tomorrow! We have so many color activities to share with you! The first thing I did was prepare the colored water. I love that the 7-day pill containers already had most of the colors of the rainbow. It was just missing indigo, but it did have a clear container that we used instead. I will say in big.bold.letters…. This is a messy activity! We were lucky enough to have a beautiful day, so we did our activity outside. If you do it inside, cover your space with a plastic table cloth and stay far away from your furniture. 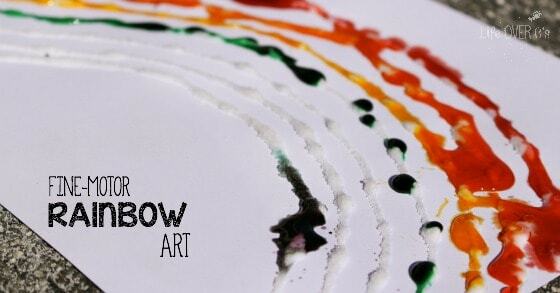 Draw a rainbow with the glue. You need 7 lines (one for each color). Because Shiloh does not have the hand strength nor coordination to draw with the glue she had lots of help from Daddy while I took pictures. 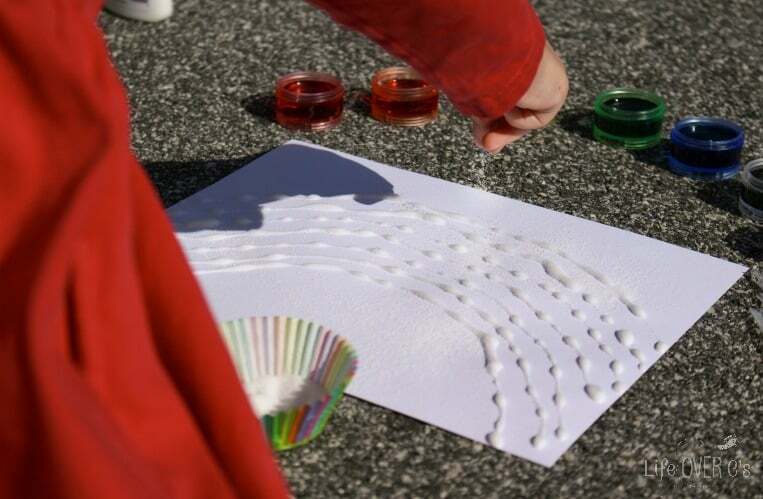 After you are finished drawing with the glue, sprinkle salt liberally over all of the glue. When you are finished gently shake the paper back and forth to help the stray salt stick to the glue. 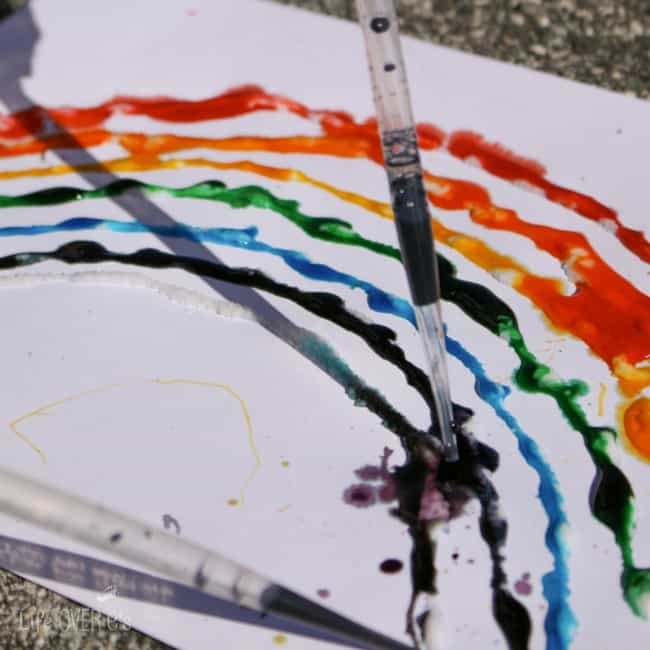 Using the droppers, squeeze the different colors of water onto the rainbow. I really loved the droppers that we got because they were long enough to reach over the paper without too much trouble and they were very easy to squeeze making them a perfect tool for Shiloh. Lately Shiloh has been chatting up a storm. I think we’re around 100 words now with some really cute phrases (a huge change from a year ago). But one thing we thought she was struggling with was her colors. Today, however, she was showing off! Blue, reen, wed, runge, p ple. She was repeating them so fast, and trying to dip her dropper at the same time that we were having a hard time keeping up with her! Daddy ditched me to go check some multiplication for daughter #2 and I was left alone with the color crazed child! This was seriously one of the most fun activities we’ve done in a long time! It’s spurred all kinds of ideas, so be prepared for more color activities coming soon! Check out what else we created after we finished with our rainbow! 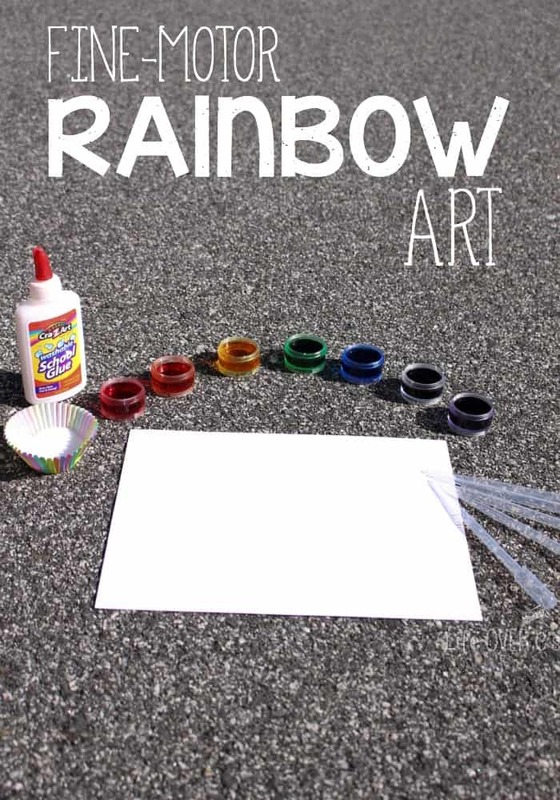 Follow Kim- Life Over C’s’s board All the Colors of the Rainbow on Pinterest.And don’t miss out on the other great rainbow activities from the #PlayfulPreschool team! This turned out awesome! So pretty. How awesome that Shiloh has 100 words now! Yes, we’re very excited by her progress! I love making art with salt. Can’t wait to give this a try with my kids they both will love it. I’m sure they will have fun! I love this activity. I know our kids would have a blast trying this out. It is also great for developing focus by remembering which glue line is which color. Very true! Especially when you have a child who is generally not good at focusing! 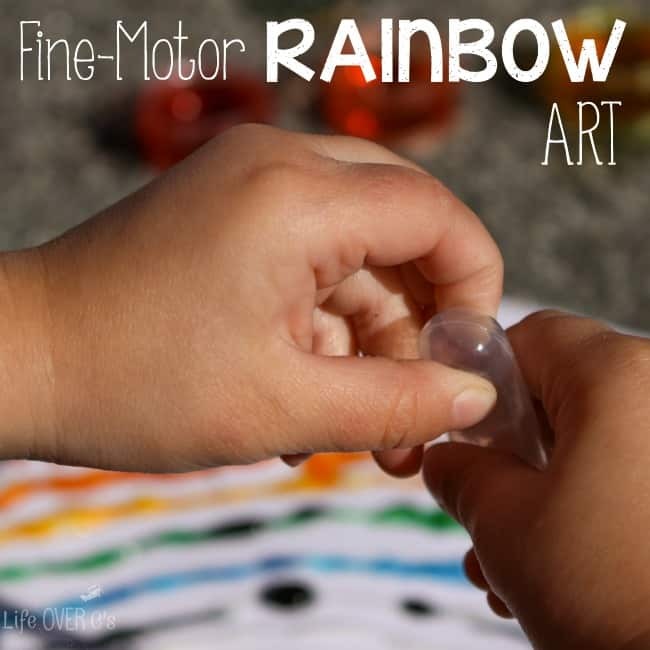 Such a fun way to combine art, science and fine motor skills! Thanks! She really enjoyed it!